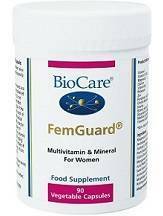 Biocare’s FemGuard is one of many supplements designed to help support overall health as women go through menopause. The manufacturer promotes this product as a comprehensive and powerful formula that allows enhances bone intensity and cardiovascular health. It also asserts this product helps with maintenance of the energy-releasing metabolism and the proper functioning of the nervous system, as well as protecting cells from oxidative stress and the facilitation of proper operation of the immune system. This review furnishes you with the facts you need to make a smart buying decision regarding a menopause supplement. The manufacturer’s recommended dosage is one capsule taken three times per day with food, or per doctor’s instructions. A bottle of 90 vegetarian capsules costs $30. There were no discounts on the manufacturer’s website at the time of writing. Prolonged consumption of amounts exceeding 10 mg of vitamin B6 per day can cause mild tingling and numbness. (Note: the daily intake of vitamin B6 when following the manufacturer’s recommended dosage is 50 mg). Prolonged usage of more than 25 mg of zinc per day can cause anemia. (Note: the daily intake of zinc when following the manufacturer’s recommended dosage is 30 mg). There is no manufacturer’s money-back guarantee accompanying the product. The manufacturer’s website does not have any verified user reviews that might provide an idea of the product’s efficacy. Biocare FemGuard comes with an all-inclusive formula that aims to help women to cope with the symptoms of menopause. It is affordable and comes with clear dosage instructions. However, it does not come with a money-back guarantee and it does not have the Good Manufacturing Practice (GMP) certification which would attest to its overall safety and quality. In addition, the warnings regarding possible side effects from prolonged use are of concern.